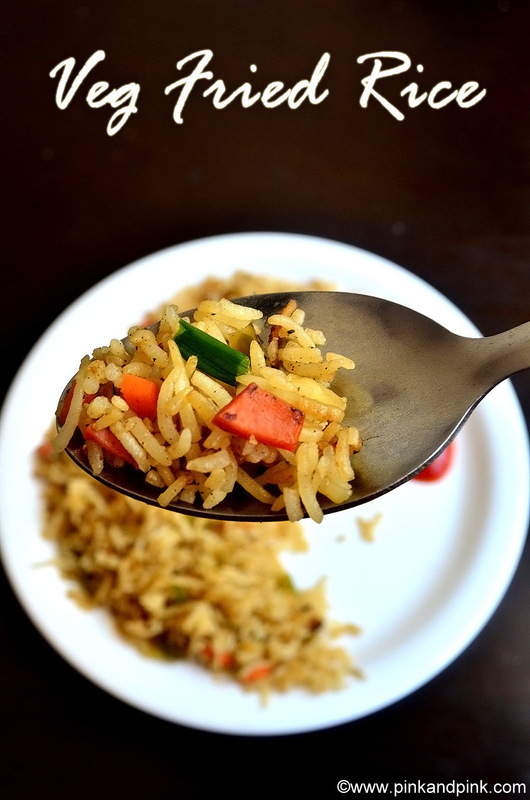 Veg fried rice recipe I have shared here (vegetable fried rice) is a healthy indo chinese main course which cannot be beaten by another indo chinese dish for lunch.Who can say no to Veg fried rice? While going for a team treat when I was working, I always choose veg fried rice if I feel like having rice. The only time consuming part is chopping vegetables. Otherwise, it is a very quick and easy recipe to go for. Even I pack it for lunch for my hubby. When compared to preparing full meals including rice, sambar or any kulambu and vegetable side dish like kootu or poriyal, veg fried rice is quite simple yet a tasty main course. I have posted Veg Paneer Fried recipe too. 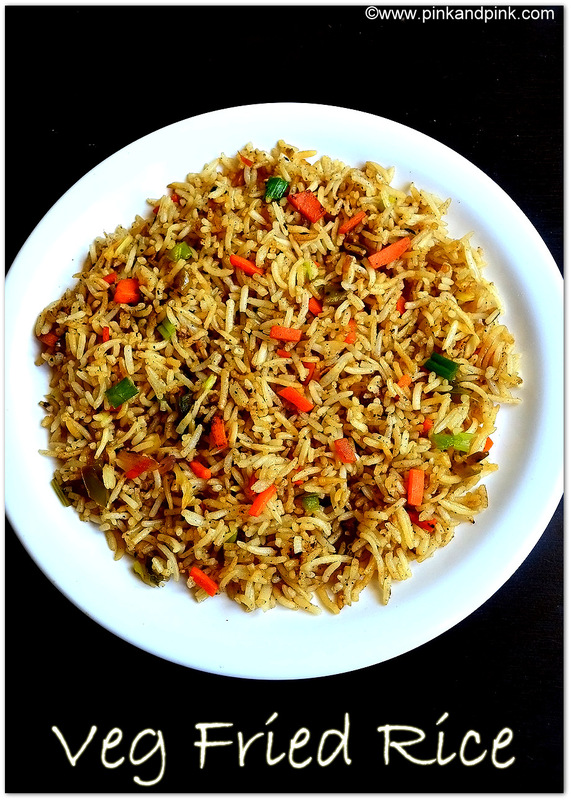 Do not forget to check it out - Paneer Fried Rice Recipe. Most of my friends prepare veg fried rice with their own creativity :) I have tried different versions of veg fried rice recipes which I got from friends too. Its long back since I tasted veg fried rice in a dhaba. I forget that taste totally. Just to decide which recipe to choose, what should I modify and to get the idea of exact ingredients used in hotels, I decided to try fried rice in a nearby restaurant here. I tried it and it came out very well. Seriously, you do not need to strain yourself to prepare anything special for it. While few people love to have it as such, I love to have it with tomato sauce. 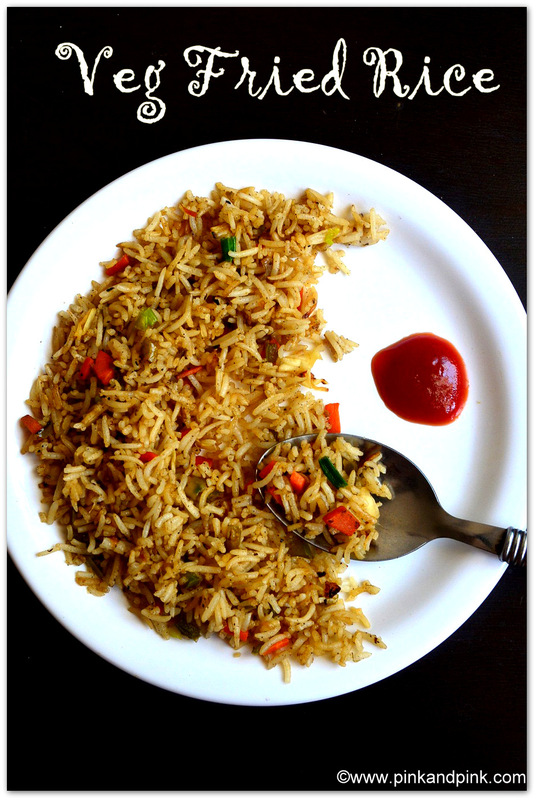 Veg fried rice and tomato sauce is a heavenly combination for me and I can never say no to it. Of course, gobi manchurian gravy, paneer peas masala, paneer butter masala and paneer tawa masala are some of the tasty accompaniments for veg fried rice. 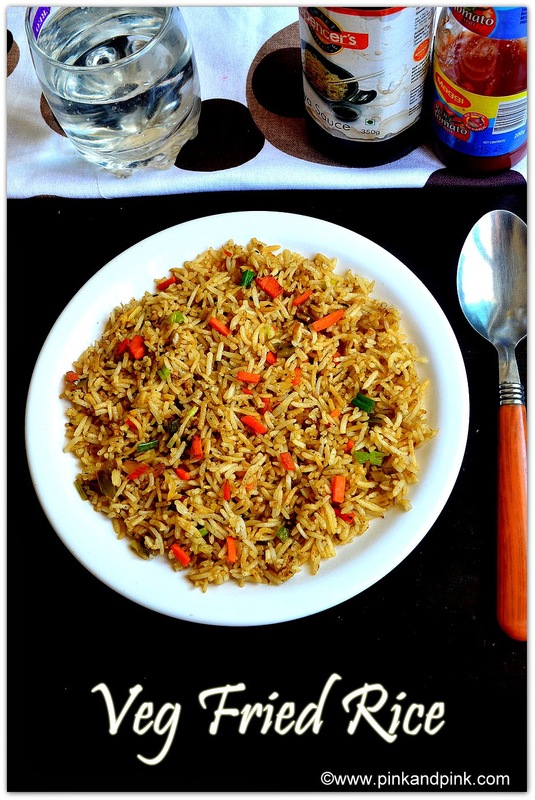 Now, let us learn how to make vegetable fried rice with step by step instructions. 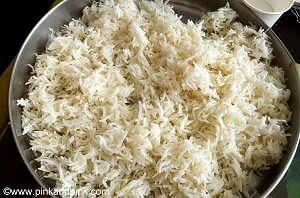 Rinse the basmathi rice at least 3 times. Add 2.25 cups to the basmathi rice and let it soak till you chop the vegetables. It is good to soak for at least 20 minutes. Chop the carrots and beans very finely. They should be small and as thin as possible. Chop cabbage into thin and lengthy pieces. Chop spring onion green and white part into small and thin slices. Chop capsicum into small pieces. Heat oil in a pan, add ginger garlic paste and saute till the raw smell leaves. spring onion white part or big onion slices in the pan. Saute till the slices turn translucent. Add carrot, beans, cabbage and capsicum and saute till the vegetables shrink. Add soya sauce, salt and mix well till the raw smell of soya sauce leaves. Add cooked rice in the pan and mix well till the rice is blended with the vegetables mix nicely. Switch off the stove and sprinkle pepper powder and mix well again. Garnish with spring onion green part. Serve hot with as such or with a side dish of your choice. 1. You can adjust the quantity of the soya sauce according to your taste. The color of the fried rice depends on the quantity of soya sauce you add. 2. You can add green chilli sauce if you want. 3. Adding pepper powder at last makes the taste of the fried rice to a heavenly one. So, do not skip it. 4. You can add sugar or 1 tsp tomato sauce to add sweetness. Serve with the below side dishes or just tomato ketchup. Tastes yummy!! !